We were packed up and on the road this morning shortly after 6am. We hit the baitshop on the way thinking that fatheads would be the ticket. Upon arrival to the Connecticut River, the weather was calm, partly cloudy, and the temp was in the low 30’s. The water was glass so we figured using the small rooftop boat would be no issue being that our only motor were the oars. 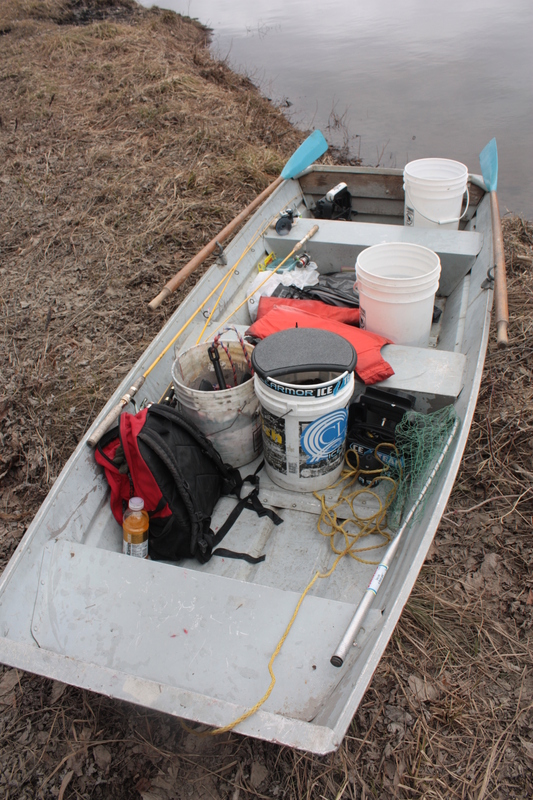 We launched the boat and quickly realized that we were in for a quick, cramped trip if the fishing was poor. We slightly over packed for the room we had. Funny thing was, we only used about a tenth of what we brought. The rest was just for added weight. The beginning started slow with only one short crappie and some decent perch being caught. We had one boil on a perch by a large northern pike as it came towards the boat. Fortunately or unfortunately, however you want to look at it, it didn’t grab the perch causing a commotion we certainly didn’t need in the tiny, flat bottomed boat! It took maybe a half hour for us to actually find the crappie in the large area that we were fishing but once we did, it was on. 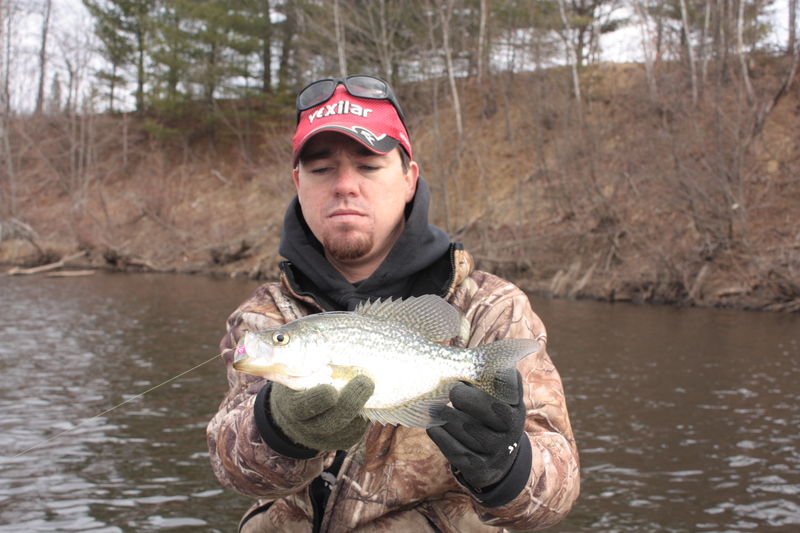 Here is the first keeper crappie in the boat for the day. In about two hours we were both able to get our limits of nice sized fish. The numbers and average size today was outstanding. One of the better days either of us have had in this hole. 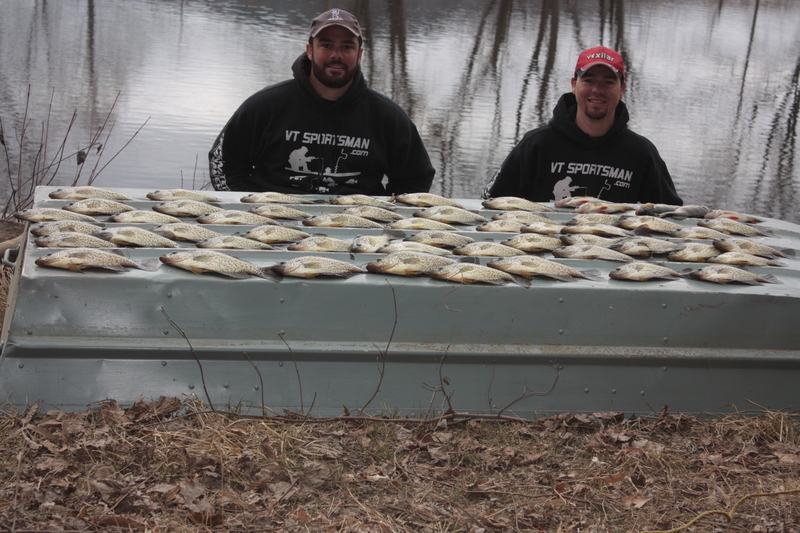 We had 43 true doubles and who knows how many dropped fish that could have skyrocketed that number! The total number of fish for the day was well north of 300. Can’t ask for much more than that! 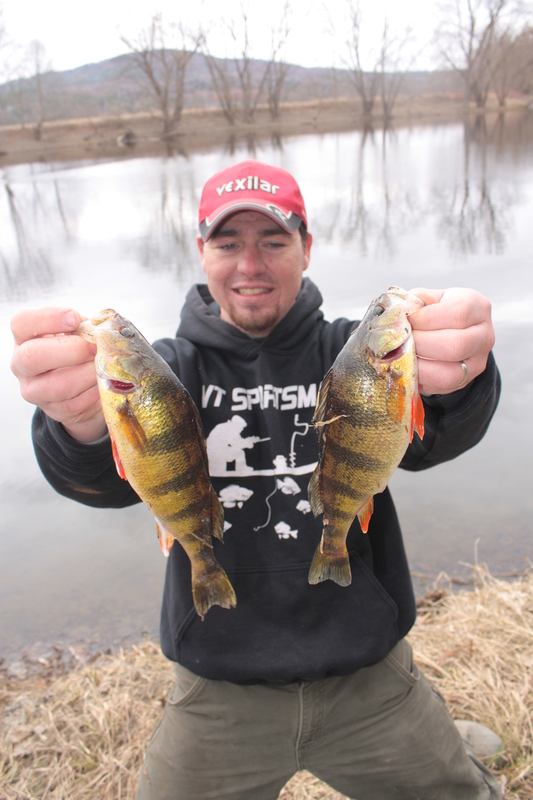 Other than crappie, we were only able to catch perch. They were moving shallow for the spawn. 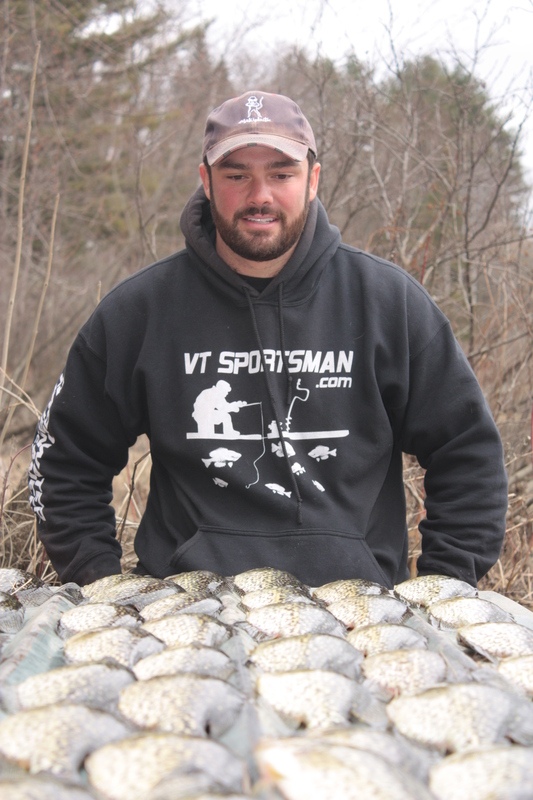 Although most were in the 8-9″ range we caught some pretty decent sized males mixed in deeper with the crappie. Fishing the shore line with 5′ under the bobber was most effective. As soon as the bait was deep enough to stand the bobber up, the fish were biting. If we would have fished the shore line more, I think we could have each gotten a few meals. We didn’t bring a thermometer but the water was still extremely cold and the fish were still holding tight in their winter pattern, suspending in deeper water. We both brought out Vexilars so we were able to know when and where the fish were cruising through. The majority of the fish we marked were down 10-14′ in 20+’ but we had the most success with out baits down only 5-6′. We had brought the fatheads thinking that we would be able to target larger fish. This proved to be a waste of money for the day. 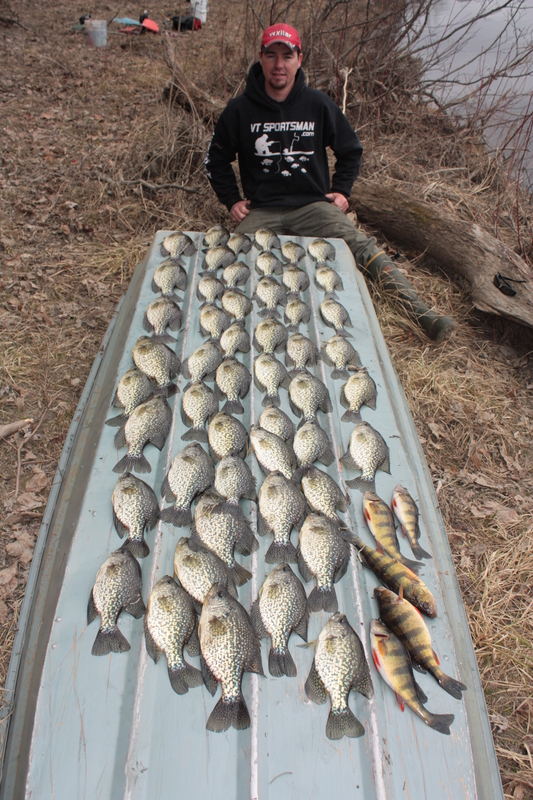 We caught one crappie, one perch, and ended up dumping the rest on shore at the end of the day. We caught the rest of fish on baby shad by Bobby Garland. We only tried two colors today so its hard to say what worked and what didn’t. I ran chartreuse and red glitter while bobby used the albino shad. With the feeding spree going on today I think any color or similar shaped bait would have been effective. Awesome catch guys! Love checking out your blog, what size/color jig head were you using? I was running a black size 4 (hook size #10) Bentley tungsten jig and Bobby had on a size 8 lead free jig head in pink. In general, we find that jig head color doesn’t matter when fishing plastics. The action is what entices the fish more than anything. we fish about a hundred mile stretch of the connecticut river. It is my understanding that there is also great trout fishing on the Connecticut River also. Is that true or has someone been pulling my leg? Fantastic Trout fishing from what I hear. It’s gets better the further North you got towards the Connecticut lakes. Vermont has superb panfishing! We get quality perch regularly. That’s an average size fish on that particular body of water.